I’ve been having lots of soup lately. Almost everyday for lunch. I haven’t tried new soup recipes in a while but I’ve had cauliflower on my mind. I probably only make cauliflower two ways: steam or boil (as part of a soup with other veggies). I decided I wanted to make a very simple soup where cauliflower got a chance to shine. Enter Paleo Cauliflower Soup. I decided to omit bacon because although it’s something I love to eat, I didn’t want anything to take away from the cauliflower and it’s just another step I can live without although it does sound like a tasty addition. Hope on over to Eat Drink Paleo to get the recipe. Lovely blog over there, so happy I stumbled upon it during my hunt for a cauliflower soup recipe. 1. Heat olive oil over medium high heat in soup pot. 2. Add onions when the oil is heated. Stir fry onions making sure they don’t stick to the bottom of the pan and burn. Fry until they are translucent. 3. Add garlic, cauliflower florets and chicken stock and bring to a boil. Then let it simmer on low-medium with the lid on for 8 minutes. 4. After 8 minutes, take the lid off the pot, begin to scramble an egg in a metal mixing bowl big enough to cover the top (alternatively, you can hold a small pan) on top of the soup pot and continue to scramble until the mixture becomes smooth and frothy. This took me a few minutes. I couldn’t get it to look as white as Irena’s. While scrambling the egg continue to let the soup simmer for a few minutes. 5. Add sea salt and pepper to soup. Then pour contents of soup into a blender or immersion blender (own one? you lucky duck, you). 6. Pulverize until you get your desired consistency. I wanted to go for smooth but I didn’t mind little bits here and there. Then mix in the scrambled egg. 7. Taste and adjust seasonings then serve. I don’t own a blender or an immersion blender (it’s on my wish list this year) so I pulverized it in 3 batches in my magic bullet. The end result was fantastic it had a strong garlic aroma (I had a small cauliflower). I had it for breakfast this morning and I’m thinking soup for breakfast is going to be something I’ll do for the winter. Great way to get more veggies in your diet. What are your favourite paleo cauliflower recipes? 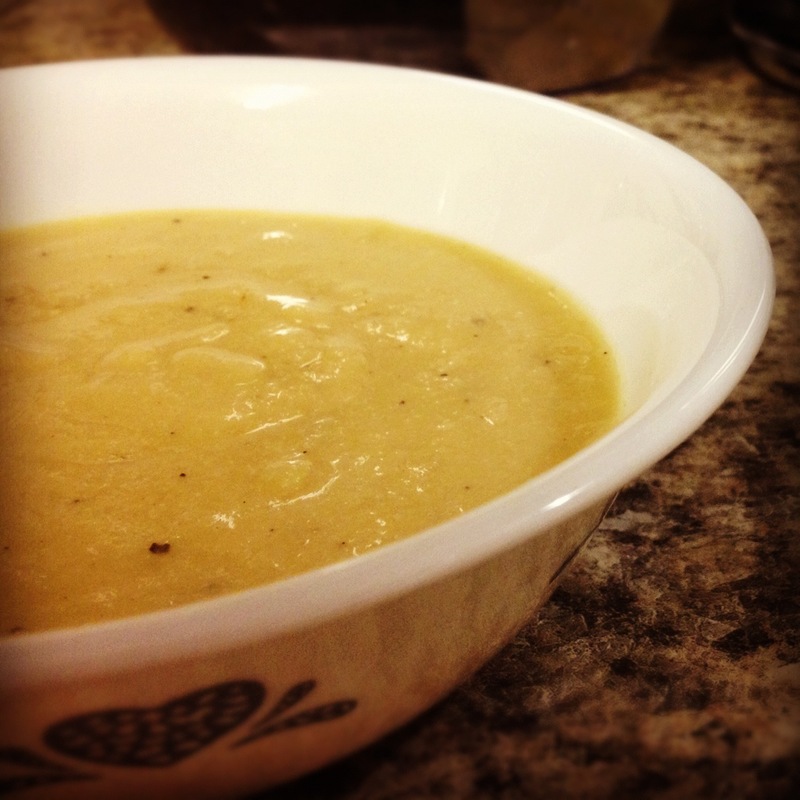 Do you have a favourite paleo cauliflower soup recipe to share?